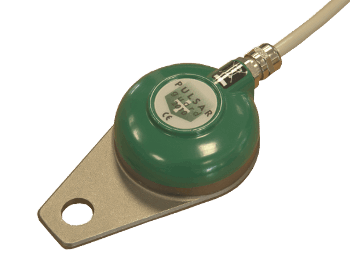 Pulsar offers a wide range of flow measurement and monitoring equipment such as their MCERTs open channel flow systems (the most accurate in the world!) and their award-winning pipe flow sensor, Flow Pulse, which offers installation cost-savings and no interruption to service. The dBMACH3 is the first ultrasonic transducer with zero effective blanking distance. 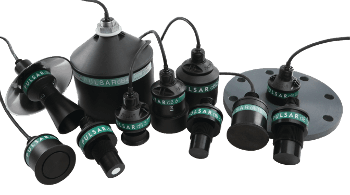 Pulsar's dB ultrasonic transducers offer reliable level, volume, open channel flow, pump control and differential measurement within liquid and solids applications. dB ultrasonic sensors utilise a low power transducer design with standard interconnecting cables - yet produce extremely high acoustic power to give exceptional results in a wide variety of challenging applications. Ultra 3 provides reliable non-contacting ultrasonic level, volume, open channel flow measurement and pump control. 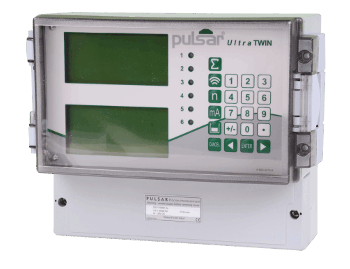 The Ultra 3 controller benefits from Pulsar's DATEM, advanced echo processing software, for reliable level measurement. Available in 4 different versions to suit your installation requirements. Please visit our product mounting options page for more information. Ultra 5 provides flexible and reliable non-contacting ultrasonic level and volume measurement, advanced pump control and measures open channel flow to BS ISO 1438 and 4359. Ultra 5 is available as a wall, panel, fascia or 19" rack mount (visit our mounting options page for more information). Flexibility is the UltraTWIN two channel ultrasonic system. 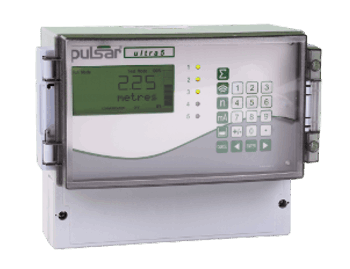 Each channel is user-configurable to operate independently either as a full function open channel flow monitor, a pump control system or as a level and volume monitoring unit for liquids or solids, calculating volumes and providing alarms. UltraTWIN is compatiable with the full range of dB Transducers. UltraTWIN features six relays configurable to either channel. Ultimate Controller is a control system that combines ultrasonic level and flow measurement, RTU and advanced pump control in one economic, easily programmed, modular unit with dedicated web server remote control and touchscreen HMI - now with WITS Protocol. Integrating the world's leading non-contacting ultrasonic advanced controller with patented functions that reduce energy costs, aid Asset Management, reduce installation and maintenance costs and improve Compliance. Ultimate Controller is modular and expandable, with peripherals offering unlimited I/O, pump power monitoring and even a remote infra-red camera, allowing remote viewing of the well and the process. 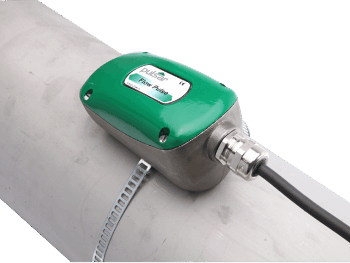 Flow Pulse® is a unique, non-invasive flow sensor that clamps to the outside of a pipe and is simply secured with a screwdriver. Flow Pulse offers you exceptional repeatability at a fraction of the cost of an equivalent magflow meter. It can reliably monitor flow across a variety of pipe materials including rigid plastic, stainless steel, cast iron and even corrugated pipes. 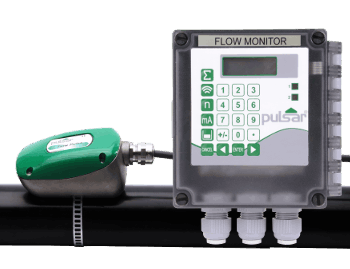 Flow Pulse Handheld Controller is an indispensable tool for portable flow monitoring, offering a toolset that allows programming, monitoring and data acquisition. 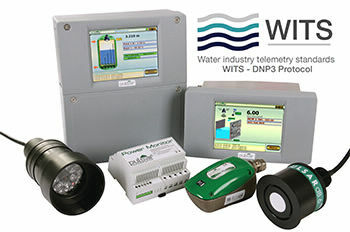 The unit is available to connect to pre-installed Flow Pulse sensors or as a self-contained kit, with instant feedback via its clear colour screen. 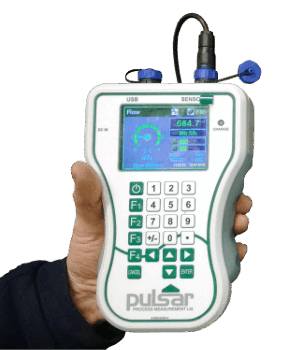 For true portability, the Handheld Controller will power a Flow Pulse directly, giving instant feedback on flow rate for a dynamic assessment of system or pump performance. 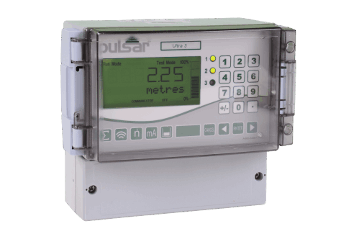 Flow Monitor is a dedicated wall mounted device for use with Pulsar’s Flow Pulse flow sensor in fixed or permanent installations. The Flow Monitor is powered using either an AC or DC power supply which then provides the Flow Pulse flow sensor with power and offers an interface via a 4-core cable. Flow Monitor expands the capability of the Flow Pulse flow sensor by providing two relays that can be programmed as alarm (relay 1) or control (relay 2) for flow or velocity, or either relay can alternatively be programmed as a totaliser. Flow Monitor also provides a mA output and onboard logging, including a daily total. Typical capacity is 36 days flow logging at 1 minute intervals (using optional logging software – UltraLog). 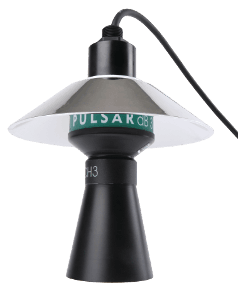 The Pulsar Guard acoustic sensor range offers reliable solids flow detection. It detects and reacts instantly to changes in solids flow and warns of blockages and foreign object detection, high flow, low flow or no flow conditions and can detect pigs within the process. The sensor provides a 0 to 10 volt output - this signal may be fed directly to a PLC or the optional control unit 2020.